Photos courtesy of George Beppu and Brian Roache. 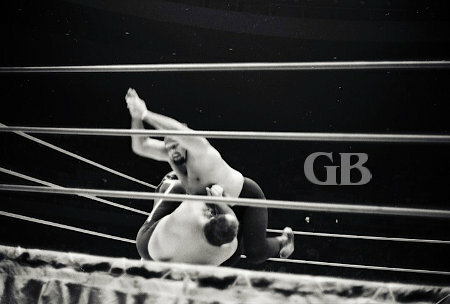 The card on July 30, 1969 featured a grudge match between former tag team partners Curtis Iaukea and Gorilla Monsoon. 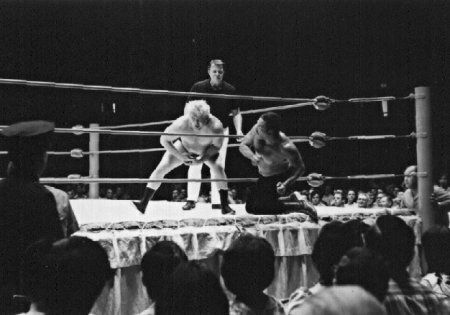 Five other preliminary matches took place at the Honolulu International Center before the main event. The results were as follows: Nick Bockwinkel pinned Masa Fujiwara, Ray Stevens drew with Rocky Montero. 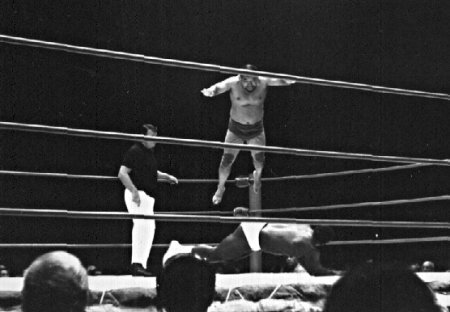 Rocky Montero hops over Ray Stevens. 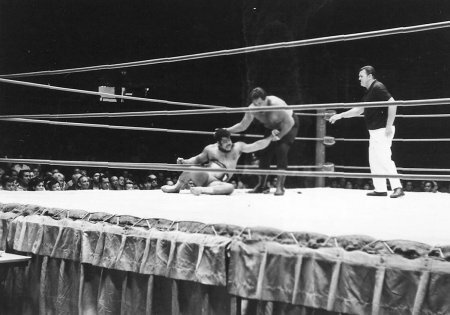 Rocky Montero downs Ray Stevens. Montero drives a knee into Ray Stevens' gut. Montero tries to hide a choke hold from the referee. 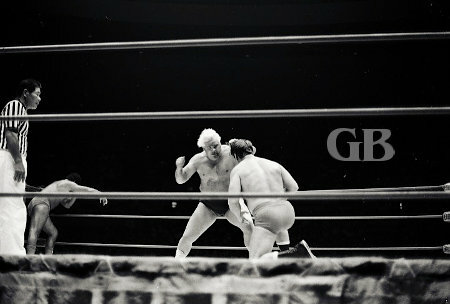 Rocky Montero works over Ray Stevens from outside the ring. 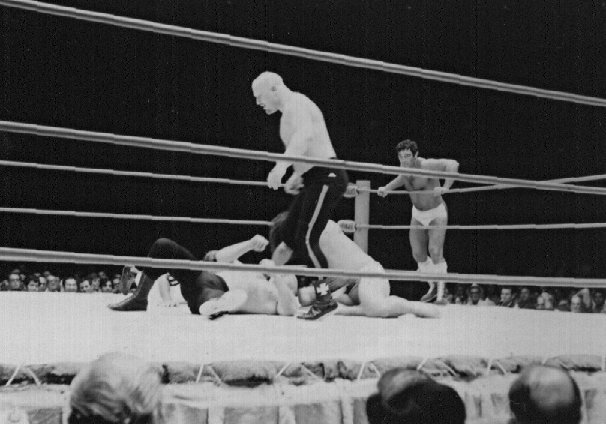 The match between Kenji Shibuya and Dory Dixon ended in a draw. Kenji Shibuya delivers a vicious chop to the chest of Dory Dixon. 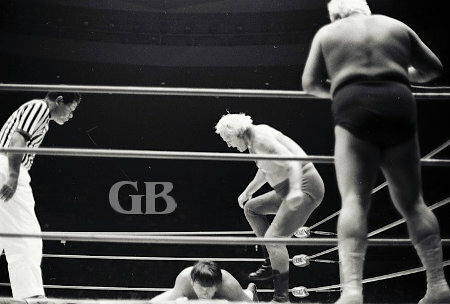 Kenji Shibuya kicks Dory Dixon on the ropes. Shibuya applies his famous Sleeper Hold onto Dixon. 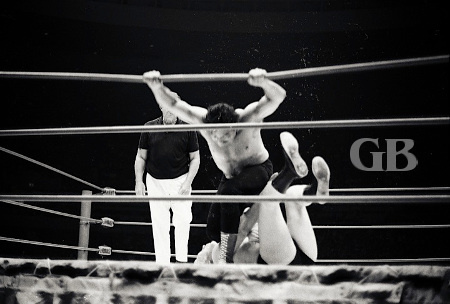 Kenji Shibuya attacks Dory Dixon from the top ropes. Chief Billy White Wolf and Peter Maivia defeated the German brothers Kurt and Karl Von Steiger on a disqualification. 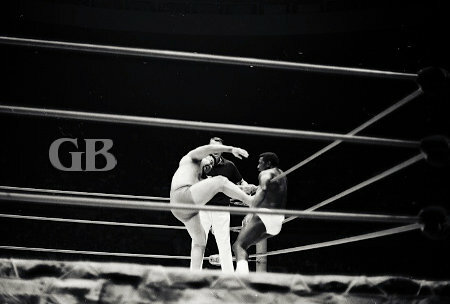 Chief Billy White Wolf delivers a jumping chop to the head of Kurt von Steigers. 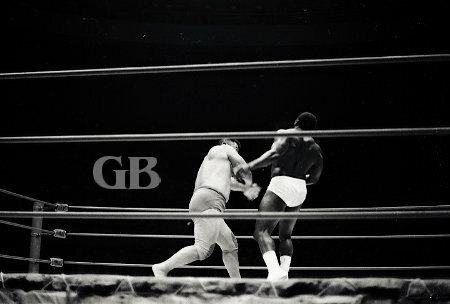 von Steiger continues his attack as Peter Maivia clings onto the ropes. 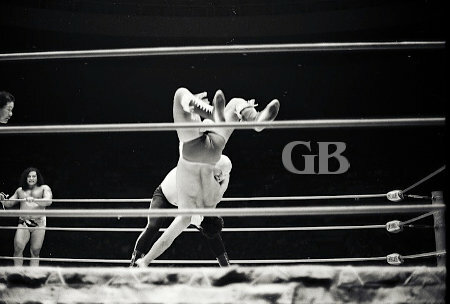 Peter Maivia on the receiving end of a von Steiger Body Slam. White Wold gets the same treatment from the von Steigers. Peter Maivia all tangled up in the ropes. 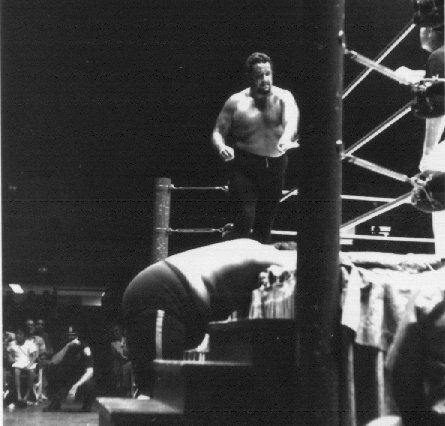 Peter Maivia takes on both Von Steigers while White Wolf watches. The tag team of Pedro Morales and Ed Francis defeated the team of Killer Buddy Austin and Ripper Collins. Ripper Collins gets ready to hand deliver the "Georgia Five" to the head of Ed Francis. 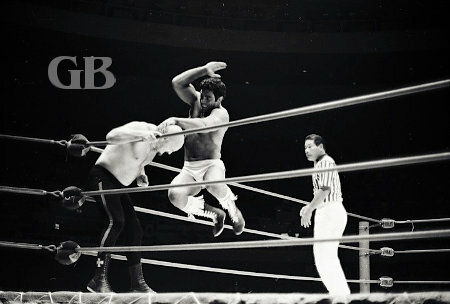 Ripper Collins tries to get up from a vicious Body Slam by Pedro Morales. 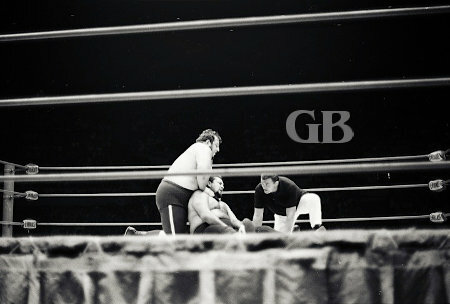 Pedro Morales reaches to apply the "Claw Hold" on to Ripper Collins' forehead. Ripper Collins earns his "Ripper" nickname at the expense of Ed Francis. Killer Buddy Austin does some serious stomping on a downed Ed Francis. Ed Francis was out cold at the end of the match and had to be revived. The main event was for the Hawaiian Championship. Iaukea, the champion, now met his arch enemy Monsoon. 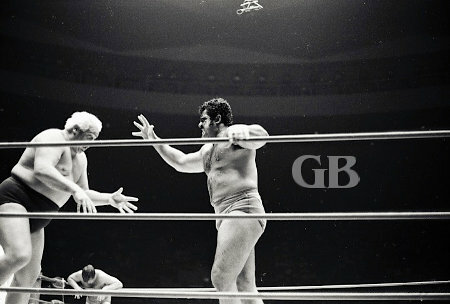 The match came to a standtill when Pedro Morales and Lord Blears entered the ring. Blears announced that the winner of this match would meet Morales for his North American Championship in the near future. Iaukea works over Pedro before the match. (4) At this point, Monsoon attacked Morales, who was still wearing his championship belt. Monsoon slammed Pedro's head into the ring post and Morales began to bleed profusely. Iaukea, who was watching the whole thing from his corner, ran over and pushed Monsoon aside and also attacked Morales. Finally, Morales had to be carried from the ring. Iaukea goes after Monsoon outside the ring. The first fall came when Monsoon used a Big Splash on Iaukea, pinning him in 1:17 of the match. 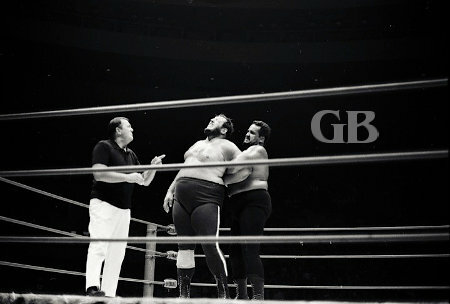 Gorilla Monsoon quickly covers a stunned Curtis Iaukea. The second fall went to Iaukea in 6:45 when Monsoon attempted his splash and missed. Curtis then covered and pinned him. Monsoon has bear hug on Iaukea. 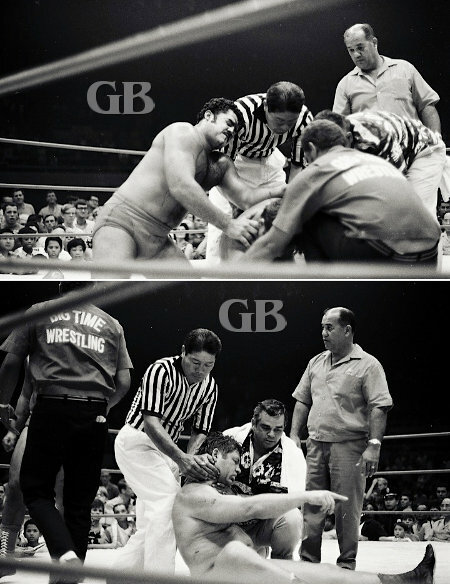 Curtis Iaukea applies a punishing Hammer Lock on Gorilla Monsoon. Monsoon returns the favor with a Bear Hug on Curtis Iaukea. 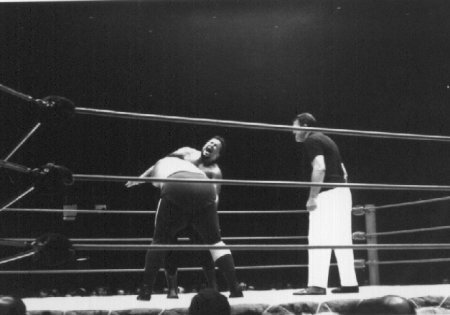 Monsoon tries to wear down Iaukea with a modified headlock. 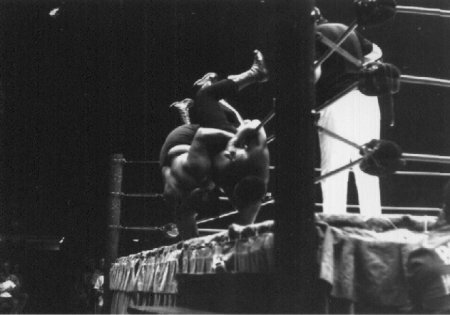 Gorilla Monsoon executes the Sunset Flip Curtis. 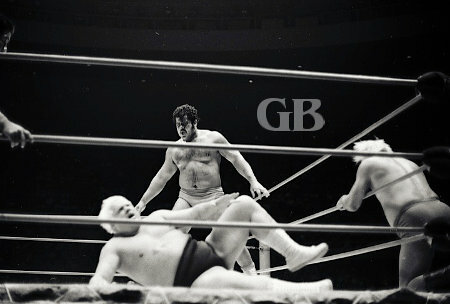 Curtis Iaukea lands the "Big Splash" on Gorilla Monsoon. 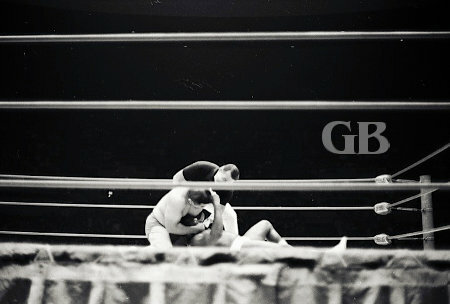 The match came to an end after Monsoon had a bear hug on Iaukea and in an attempt to break the hold, Iaukea sent both wrestlers through the ropes and onto the floor outside the ring. The referee started to count both wrestlers out and Monsoon was able to get up before Iaukea. As a result, Monsoon won the match and not the title, since the title cannot change hands as a result of a count out. Also, as a result of winning the match, Monsoon would meet Pedro Morales in the future for his North American title. Monsoon and Iaukea going over the ropes.